Some days I had such a deep feeling of despair when I looked at my Outlook calendar. Frequently there would be days with at least five hours taken up with back to back 30 minute meetings. Little time to prepare for them, even less time to reflect on what had been discussed. And completing my assigned actions? That was normally done after I put the kids to bed. It is hard to work an 8 hour day when 5 hours are spent talking. Sound familiar? Yes, I know I am not alone. And depending on who was leading the meeting would depend on whether there were any actions coming out of it. Sometimes we would just talk about problems, hypothesis about solutions and then arrange to meet again next week to do the same thing. Aaaaaah! Think about the impact this meeting mania is having on you, your team and your business. Frustrated Employees: Feeling like they have achieved something is key to an employee being satisfied with their day. When you have been in back to back meetings, do you feel that way? Productivity: You have business goals. Does more talking than doing get you there? Cost: Look around a meeting you are in today. Estimate the hourly rate for each of the attendees and calculate the cost of that meeting. (Try this great free calculator from HBR). Is it justifiable based on the topic you are discussing? So how do other business leaders deal with this problem? “Interaction should be constant, not crammed into meetings once a week. We don’t have meetings unless absolutely necessary. When I used to have meetings, though, this is how I would do it: There would be an agenda distributed before the meeting. Everybody would stand. At the beginning of the meeting, everyone would drink 16 ounces (1 pint) of water. We would discuss everything on the agenda, make all the decisions that needed to be made, and the meeting would be over when the first person had to go to the bathroom.” Caterina Fake, the co-founder of photo sharing site Flckr. An intriguing approach! But Caterina makes a great point. Effective meetings need focus. “Be specific about why you are having the meeting and what you want to walk out the door with at the end”. What can be learnt from the Startup world? You can spend hours in meetings and still not make the right decision. Think about how much these meetings are costing you. Make a decision, have a mechanism to monitor it closely and act quickly if it does not go exactly to plan. How much time is wasted in a meeting by repeating what has already been discussed with a latecomer? This is frustrating, but hard to avoid when you are jumping from one meeting straight into another. Perhaps make it known that meetings start sharp at 5 past the hour, and recaps won’t be possible for latecomers. If all essential attendees are not present, reschedule the meeting if the time will not be valuably spent. Agendas should be distributed before the meeting. It doesn’t have to be fancy. Key points in the calendar request might be enough. Send out pre-reading beforehand. Make the best use of the time you have people around the table. Document, circulate and make people accountable for their actions. What is the laptop etiquette for this meeting? Are you going to get the focus you need if people are catching up with email? People should be allowed to decline a meeting if they think they will not add any value. As the meeting leader, listen for people that are not contributing. Bring them into the conversation. It is difficult, at times, for people to compete with those that have no problem with voicing their opinions. Sometimes those ‘loud, confident voices’ need to be kept on topic, and politely told to shut up so others can input too. We all know people like this. Effective meetings are not a one man show. Do you need that meeting? Well-structured meetings can achieve amazing results. And I shudder at the thought of businesses being run by email alone. Collaboration is critical to success. But this can sometimes be done less invasively of people’s time by picking up a phone or walking up and talking to someone. If you are experiencing this meeting epidemic, think about what you would like the workday to be like for your team. Does your team need training on managing effective meetings? As with so many things, we assume that people know how to do this when they get promoted. Not so. There is some great free training at Mindtools.com and Manager-tools.com to get you started. What guidelines could you put around why, when and whether meetings should take place? This is not meant to be dictator like. 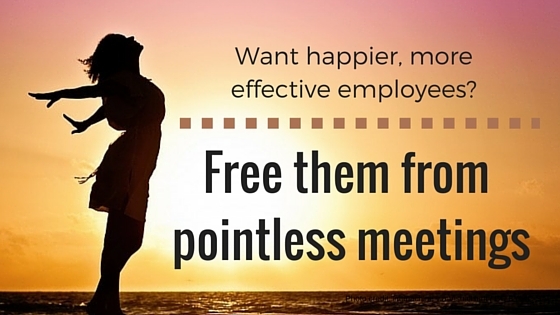 This should be done in collaboration with your team with the emphasis of freeing up their time. Find a way that is better than today, try it and keep tweaking it until it gets better again. Even if you can’t change the whole company, you can improve the day to day for your team. Start the revolution today!